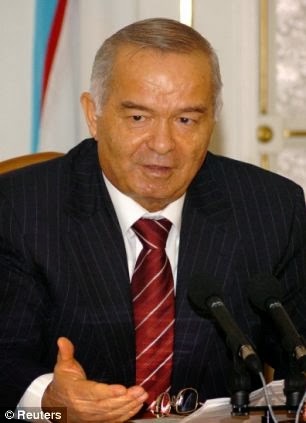 The West is on alert over a possible coup in Uzbekistan as powerful henchmen surrounding 75-year-old ruler Islam Karimov battle with his glamorous but hated daughter Gulnara over the succession to the ailing autocrat. Ruthless secret services chief Rustam Inoyatov allegedly presented her iron-fisted father a dossier of compromising materials including 'semi-naked pictures' of the 'Uzbek princess' and allegations of monumental financial corruption in a bid to permanently discredit her. This resulted in the incandescent president hurling an ashtray and mobile phone across his desk at his ex-KGB intelligence boss, but also summoning his 41-year-old daughter and slapping her in the face, it has been reported. Gulnara previously seen as untouchable, was last week stripped of her lucrative television and radio holdings in Uzbekistan, in an extraordinary clampdown on the most powerful woman in Central Asia. The 41-year-old amassed a fortune worth an estimated £400 million under her father's corrupt rule which began with the fall of the USSR when the gas and cotton rich country gained independence. It is unclear which allegedly revealing photographs offended the Muslim president - who was once a member of the Soviet Union's ruling politburo. However, Gulnara was pictured in April wearing little more than peacock feathers in a shoot. Karimov summoned his top officials, and accused them of keeping him in the dark over his daughter's excesses. 'The President cursed at Prosecutor General Rashid Kadyrov for disguising the truth about financial and other deals of Gulnara Karimova. Interior Minister Matlubov was accused by the President of misleading him. A total of 18 high ranking officials were arrested or dismissed and a number of Gulnara allies fled abroad, it was reported. After summoning Gulnara, Karmimov first slapped her and then really started to beat Gulnara. He said that she disgraced the family in front of the whole world. 'The President's bodyguards tried to calm him down. 'Later, the President asked all his bodyguards and servants to leave him alone. He did not go into the building of the residence, but decided to have a walk in the garden. The noose has been tightening gradually on Gulnara who in July was removed as ambassador to the UN in Geneva, and so forfeited her diplomatic immunity. She is reported to be under criminal investigation in France and at least one other European country.